All 1/35 Scale Figures and Creatures. 1/1 Scale There are 3 products. From the team that brought you the Chrononaut and the Mushroom Goblin comes the Scrap Goblins! 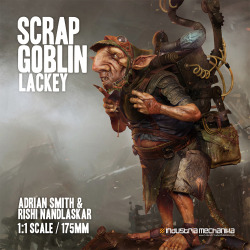 This 1:1 scale subordinate Lackey goblin kit comes decked out with lots of scrappy details and is ready to hunt down his next shiny treasure. 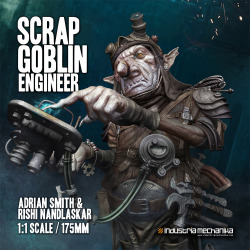 Pair with the Scrap Goblin Engineer kit for an unstoppable tech-hunting team. From the team that brought you the Chrononaut and the Mushroom Goblin comes the Scrap Goblins! 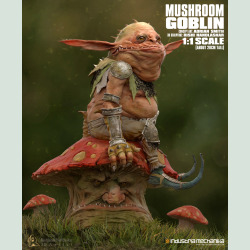 This 1:1 scale boss engineer goblin kit comes decked out with lots of scrappy details and is ready to hunt down his next shiny treasure. Pair with the Scrap Goblin Lackey kit for an unstoppable tech-hunting team.